My return trip from London usually involves a late train. That way I never have to worry about leaving the office on time, getting stuck on a delayed tube and missing the train. It does, however, mean that I’m hanging around for up to two hours at Euston. This is where a cheap First Class upgrade comes in handy. By "cheap" I mean that you get the very lowest tier of First Class ticket. These are only available after they stop serving hot food to your seat, and instead you get a sandwich and a banana. However usually they put the most expensive tickets at the front of the train so they get first dibs on all the snack food, and by the time yours truely gets served the sandwich choice is probably only egg. It’s still better than at weekends, where you have to fetch everything yourself. And as the shop is right in the middle of standard class, you have to climb over three carriages of poor people (you can’t hear the irony, but it’s there I promise, because I only use the train at the weekend on a free ticket) to pick up a "snack box" that contains a couple of crackers and some dried fruit. Still, it means I get somewhere warm to sit for a couple of hours with an unlimited supply of complimentary coffee and crisps. Today, they even have some rather nice chocolate truffles. I was actually disciplined enough to just have one. Impressive. When I’m bumming about in the lounge above Euston Station, I’m usually online. No change there. There’s a wifi hotspot – touted as a feature of first class, when you still have to pay £4/hr to use it – but I now have my super funky phone with wireless modem and unlimited data calls, which is just as good when there’s 3G coverage. Today, the phone said I had a full four bars of 3G signal but I couldn’t connect to squat. It dialed, it thought, it gave up. Same thing happened trying to get online from the phone itself, and it’s still the same problem now that I’m on the train. I waited a good ten minutes on hold to T-Mobile, but nobody is there this time of night… at half past six? Unlikely. So I decided to bite the bullet – and bite into some complimentary fruit cake – and pay for the wifi. I still had over an hour to kill and thought I may as well do something useful, even if "something useful" is trying to find out whether the 6-max $2/$4 game at Noble Poker is as soft as it appears to be, or if I just ran very hot so far. The early signs are good (and here I go tempting fate again). Sure, I’ve been getting lucky with some hands, but it’s so lovely and passive, they’re just always letting me catch up – and then paying me off! Of course I don’t mind winning $30 pots with two pair made on the turn from 47o in the big blind, it’s just a little embarassing… I’m sure people in the lounge were watching me! However, as I’ve bought into Gutshot folklore, I was particularly pleased with this hand. 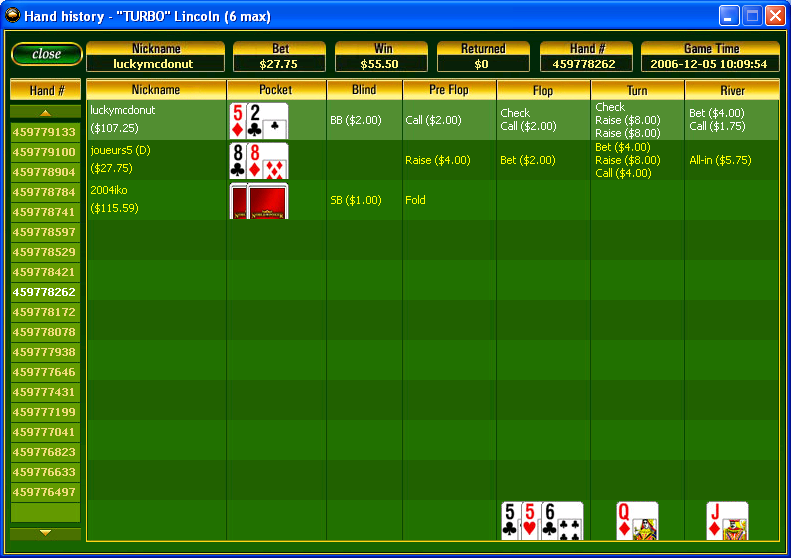 Would have been worth an extra $50 at their online cardroom too! Well, for some sites anyway. Noble Poker worked just fine. I could see the lobby and sit at tables. The only problem was accessing the cashier, which uses web pages within the client. But as I already had a balance, I could play away happily. And, yes, it still feels pretty soft. I think Stars will work, although I couldn’t test it properly. It tried to get a software update, presumably from a web site, and failed. Party Poker and Mansion would not connect at all, but Paradise worked fine, and their cashier does not use the web so it looks like you get full functionality. For free! That’s about all I had time to check, but I’ll be doing more research! They definitely block web and email access until you sign in with a credit card, and apparently MSN messenger too. However I could connect to ICQ and Yahoo! Messenger without any problems, and without paying! I only have limited experience with wireless hotspots. The odd hotel and airport, and once at Starbucks when it was the hot new thing, which was memorable because it just didn’t work. I wonder just how many actually allow free access like this!